The birth and growth of Irish Taekwon-Do and the R.I.T.A. can best be mapped by following the Taekwon-Do career of one man; Master Robert J. Howard 8th Degree. 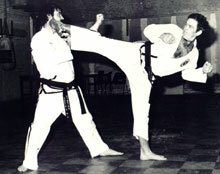 When Master Howard first became involved in martial arts over thirty years ago, Taekwon-Do was unheard of in Ireland. He started his training in Karate in 1966 in Gardiner Place, Dublin. After several years of training, a Korean instructor arrived in at the club and began teaching them. The Korean, Yung Wu Kwon, a third degree, had come to the country to work. Kwon explained that he was teaching the Korean art of Taekwon-Do. Mr. Howard (as he was then) and his classmates (such as Liam Dandy, Frank Matthews, and Paul Kavanagh) had never seen techniques like these before and were extremely impressed. 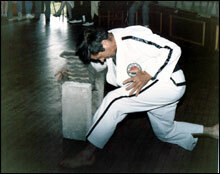 Later, another Korean instructor, Chang Ho Cho fifth Dan, started teaching and training in the hall. Mr. Cho graded Mr Howard, Mr Dandy and Mr Matthews to red belt, but shortly afterwards he had to leave for the U.S. in search of work. The class continued to train together and after a while they heard of another Korean Black Belt who had just arrived in England from Singapore. Despite a great deal of effort they were unable to contact him but like all good practitioners of the art, they persevered and it was Liam Dandy who made the first breakthrough. Mr. Dandy was on his honeymoon in England when he heard that the Korean instructor was teaching in Coventry. He eventually tracked down the hall where he trained, only to discover that the instructor was away on holidays. Unwilling to give up, Mr Dandy obtained a contact number for the instructor from the caretaker. 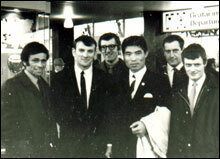 On returning to Ireland, Mr Dandy and the other practitioners managed to contact the Korean instructor, Mr. Rhee Ki Ha (then a 5th Dan), and arranged to visit him in Coventry. After the meeting, Mr. Rhee agreed to come to Dublin and watch them train. 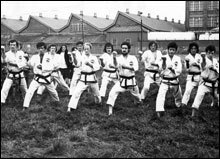 After watching and studying them train in Dublin, Mr. Rhee informed them that they had been practising Tang Soo Do and not Taekwon-Do. Nevertheless, he agreed to take them on as students, thus becoming the father of Taekwon-Do in Ireland. In 1968, Mr. Anthony Phelan joined the school, after witnessing an impressive demonstration of Frank Matthews' skills on three unwitting attackers during a night out in Dublin. Master Rhee travelled to Dublin on a monthly basis to instruct and train the Irish students for a whole weekend at a time. In May 1971 the three friends were tested for their black belts in Oxford, England. Their patterns and techniques were rigorously tested. As a test of power they were required to break two inches of timber with an array of kicks (both legs), punch ten tiles and finally chop a house brick. Mr Howard, Mr Dandy, and Mr Matthews passed to become the first Irish Taekwon-Do black belts. On returning to Dublin the trio set in motion a programme to establish a strong Taekwon-Do presence in Dublin. 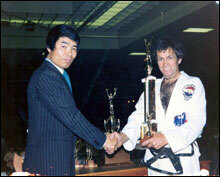 One year later in 1972 with the help of Master Rhee, the Republic of Ireland Taekwon-Do Association was born. With the National governing body for Taekwon-Do now formed, the members of the R.I.T.A. travelled around the country performing demonstrations in order to develop public awareness of the art. As public awareness grew, Taekwon-Do schools were established throughout Ireland. In June 1973, Mr. Howard, Mr. Dandy and Mr. Matthews were awarded their second degrees at a grading in Dublin. This coincided with the first home international against Turkey. On this first occasion, Ireland were the gallant losers, but it did not take long before success was to come our way. At the 1974 World Championships, held in Canada, Ireland came third overall, with Mr. Dandy taking the title of best fighter. The following year, Ireland won the England v. Ireland Championship and three years later at the 1978 World Championships held in Oklahoma, U.S.A., Mr. Howard won two silver medals while Mr Dandy took home one gold. On the home front, the process of spreading Taekwon-Do continued, and by the time Mr. Howard and Mr. Dandy received their fourth degrees in 1979, Taekwon-Do was well established in Ireland. During this time of development for Taekwon-Do in Ireland, Mr. Howard had the honour of representing his country in many international competitions. On receiving his fourth degree he ceased being an international competitor but continued to travel abroad to tournaments as an international umpire. Unfortunately, for reasons of their own, in 1984 several senior members of the R.I.T.A. decided to leave the I.T.F. Mr. Howard remained with the I.T.F. although he was left with a national organisation which was severely weakened and reduced in size. As chairman of the R.I.T.A., Mr. Howard and another senior member in the association, Mr. Anthony Phelan set about the task of reestablishing I.T.F. Taekwon-Do in Ireland. Steadily, the R.I.T.A. began to grow from its remaining schools around the country and spread into new areas. A few years later, in recognition of their efforts to strengthen I.T.F. Taekwon-Do in Ireland, Master Rhee presented Mr. Howard and Mr. Phelan with awards for their indomitable spirit. At the same time, Master Rhee honoured Mr. Howard by bestowing upon him the position of president of the R.I.T.A. As the I.T.F.’s representative in this country, the R.I.T.A. was now going from strength to strength and several members who had left the I.T.F. ten years previously rejoined the R.I.T.A. 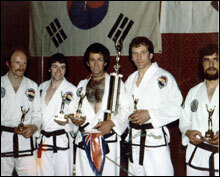 In 1995 both Mr. Howard and Mr. Phelan received their seventh degrees and became the first Irish men to become Masters in Taekwon-Do. At the time of their awards there were only two other Europeans to hold such a title. In 2011 Master Robert J. Howard, was promoted to Taekwon- Do Grandmaster, 9th degree black belt, at the 17th ITF World Championships in Pyongyang, North Korea.